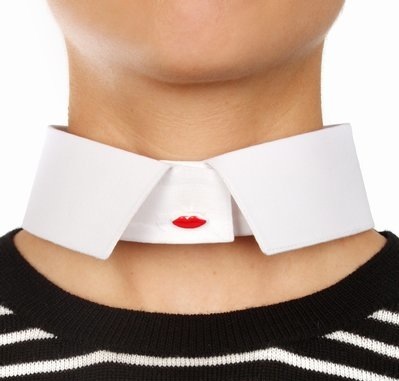 I'm really into stand-alone collar situations and this one by Delfina Delettrez is kind of perfect? It's so crisp it's almost monastic and the little red lips in the middle are the perfect cheeky detail. I obvz need a whole collection of little jaunty collars. it's all in the details-le radness! This is so so so clever and so so so pristine. If someone wore that in front of me, i might not be able to resist kissing their neck! The collars by DimePiece are just as good and only 40 bucks! Big ups to dimepiece for making fashion AFFORDABLE.